Virtual reality is growing more popular every year. It has revolutionized gaming, but it’s not limited to games. VR is used in travel, shopping, education, and more. However, not everyone has money to drop on an Oculus VR headset. The search for a quality VR headset that didn’t cost hundreds of dollars led me to the Pansonite VR headset. You can have an impressive VR experience, but is the Pansonite VR headset right for you? At the time of writing this article, the Oculus Rift, PlayStation VR, and HTC Vive are the top-rated VR headsets according to PCMag. However, these each cost several hundred dollars and require either a high-end computer or PlayStation to use them. There are also cheaper headsets that use smartphones and can cost as little as $15. So, what kind of VR headset do you need? Here are some things to consider as you decide. If you aren’t willing to pay at least $250 or more (plus the cost of a PlayStation or a computer with a high-end graphics card if you don’t have one), then you will have to look to a mobile VR headset. ​Do you have a good smartphone? You need a good smartphone to use a mobile VR headset. If your phone model is several years old, you may find that certain VR use is either incompatible or doesn’t function well. ​​What do you want to use the VR headset for? Tethered VR headsets (headsets wired to a computer or gaming console) have better graphics and motion tracking and have more/better apps. So, if you want high-end gaming, you’ll probably want a tethered headset. If you are alright with more limited motion tracking and plenty of entertaining, but lower image quality, apps, then a mobile headset may be a good choice for you. The Pansonite VR Headset is a mobile VR headset, meaning it provides lenses and a structure to put on your head but requires you to use your smartphone for the screen and computing. It is compatible with both iOS and Android smartphones. The headset has a three-strap harness system that prevents the headset from slipping around on your head. This harness system also reduces the pressure that the headset puts on your nose, making it more comfortable. Unlike other mobile headsets, this model of the Pansonite VR Headset does not have headphones. It does, however, have a hole in the phone case which allows you to plug in your headphones or earbuds. As with all mobile VR headsets, you are not tethered to any device which allows for free movement. Unfortunately, also like all other mobile headsets, the Pansonite VR Headset is limited in its motion tracking to 3 degrees of freedom. Rolling (tilting your head towards your shoulders). Pitching (tilting your head forward and backward). Yawing (swiveling your head left and right). The Pansonite VR headset is a good mobile headset at an excellent price, but it doesn’t have all the features you would get with a much more expensive, tethered headset like the HTC Vive. The Pansonite VR headset head straps go over the top of your head as well as the sides. This helps to give increased stabilization on your head. It also prevents the headset from causing discomfort from having too much weight on your nose. With the straps properly secured, it reduces about 30% of the headset’s weight is on your face. The nose cradle has also been enlarged from previous models to fit different sized noses and allow for greater comfort. Some mobile headsets do not have removable front plates or force you to slide your phone into the casing. This usually covers your phone’s camera and prevents you from being able to use augmented reality apps, which require the use of the camera. Other mobile headsets have a removable front plate, but no velcro strap, forcing you to have to hold your phone in place if you remove the front plate. The Pansonite VR headset has both a removable front plate and velcro strap to hold your phone in place when you remove the front plate. This allows you to use your phone’s camera for AR apps while keeping your hands free. The surface of the headset that touches your face is padded and covered with soft, breathable leather fabric. This pad is both comfortable and allows the heat from your body to dissipate for greater comfort during extended use. The leather cover is also detachable so you can easily clean it. The Pansonite VR Headset has 42mm Japanese PMMA lenses. These are high-definition lenses that give a 120-degree viewing angle or a more immersive experience. The lenses are also aspherical. Spherical lenses create aberrations (areas with a lack of focus) which can make parts of an image look fuzzy. Aspherical lenses correct for that issue, leaving you with a clear image without fuzziness. This not only creates a better image but also lessens or prevents the sense of vertigo that some people feel when using VR headsets. Aspherical lenses also tend to be thinner which reduces the overall weight of the headset. Object distance (OD), sometimes called focal distance, can be adjusted forwards and backward allowing you to have a clear image that is comfortable for your eyes. The object distance can be adjusted easily at the center, top of your headset. You can also adjust the pupil distance (PD) for each eye. The distance between your eyes is unique to you. You need the lens for each eye to be in the proper position or the image can become fuzzy, and your eyes can feel strained. By adjusting the pupil distance for each eye, individually, you can position the lens properly in front of each eye. You can adjust the pupil distance with a knob on either side of your headset. The combination of the object distance and pupil distance adjustability also allows for people with myopia under 600 degrees, hyperopia under 300 degrees, and astigmatism under 100 degrees to have the lenses adjusted to suit your vision needs. The Pansonite VR headset is compatible with both Android smartphones and iPhones. The phone casing also fits a wide range of phone sizes from 4.7 inches to 6 inches. The velcro strap in the phone casing holds your phone in place to prevent sliding. I mentioned above that the Pansonite VR headset has a removable front plate. That front plate is held on by magnets. Other headsets use plastic pieces that snap the plate into place. Those plastic pieces can wear out over time and break, whereas the magnets the Pansonite uses will not break off. The velcro strap not only prevents the phone from sliding around while you use your headset, but it also provides additional security for your phone when removing the front plate, preventing the phone from falling out and breaking when you detach the front plate to remove your phone. Sure the newer iPhones only use Bluetooth, but for those using Android phones (or older iPhones), you may still use wired headphones or earbuds. The Pansonite VR Headset has an opening in the phone casing to run your headphone wire while the front plate is attached. At the cost of about one-tenth of what some VR headsets cost, you’ll be hard-pressed to beat the price of the Pansonite VR headset and still have a decent level of quality. Sure, you can get something that costs $15, but you will likely sacrifice lens quality and comfort. You may even have to hold the thing up to your face as some cheap VR goggles don’t even have head straps. What Are People Saying About The Pansonite VR Headset? I looked around the web to see what other people thought of the Pansonite VR headset and what their experience has been. The vast majority of reviews I found reported very positive experiences, raving about the comfort of the headset as well as the virtual reality experience. The other common comment was about the value of the headset for the price. Pansonite isn’t the only mobile VR headset on the market. So, how does the Pansonite VR headset hold up to some of its competitors? The VR Wear 3D VR headset is very similar to the Pansonite headset. Both have high-quality lenses, three strap harnesses, and breathable leather face pads. They also both have vented phone casing and holes for headphone wires. The VR Wear headset, however, has a lower viewing angle, only 105 degrees, compared to the 120-degree viewing angle for the Pansonite headset. This makes for a less immersive experience as the image you are viewing won’t fill your field of view. That said, the VR Wear headset has some advantages over the Pansonite, including being able to adjust the object distance individually for each eye as well as being able to fit slightly larger phones, up to 6.3 inches compared to the 6 inches with Pansonite. Also, the VR Wear headset is currently cheaper than the Pansonite. The VR Wear headset will likely work better for you if you have a phone between 6.1 and 6.3 inches or if it is too much for you to spend. The Pansonite, however, is a better fit for those who want a more immersive VR experience. If the VR Wear headset sounds right for you, you can pick one up on Amazon by clicking here. The BlitzWolf VR headset is very similar to the Pansonite headset. Both have a hole for a headphone wire, soft and breathable face padding, and quality aspheric lenses which are adjustable for object and pupil distance. The most significant two differences are in the head strap design and the front plate design. The BlitzWolf headset’s straps have a large piece as part of the strap that goes over the top of your head, and the back has some additional straps which could provide an even more stable and comfortable fit than the Pansonite. The front plate for the BlitzWolf headset is held in place with magnets like the Pansonite; however, the front plate isn’t completely removable, it’s hinged. In addition, instead of your phone casing being attached to the goggles, the BlitzWold headset has the phone casing in the front place. This means you can’t open the front plate and still use your headset. This combined with the fact that the front plate is not transparent means you are not able to use augmented reality (AR) apps with the BlitzWolf headset like you can with the Pansonite. If you need to save or are concerned that the Pansonite headset won’t be stable enough, then the BlitzWolf headset may be a good choice for you. If you want to use augmented reality apps, then the Pansonite headset is probably a better option. If the BlitzWolf 3D VR headset sounds like something you would like, you can order one on Amazon by clicking this link. 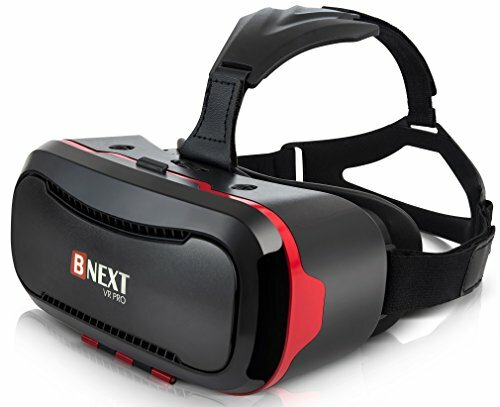 The BNext 3D VR Headset is about the same price as the Pansonite headset. It has adjustable lenses and a hole for headphone wires. 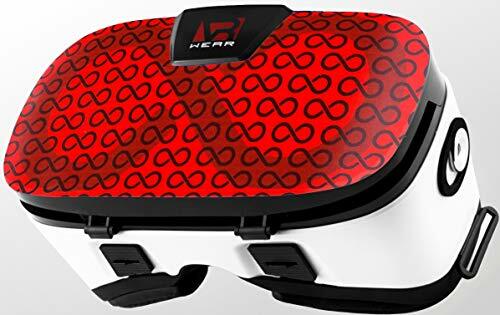 It also has breathable foam for the padding where the headset rests on your face, and it has a three strap harness. The BNext VR headset fits slightly larger phones than the Pansonite, fitting up to 6.2-inch phones. However, from what I could find in other reviews, the BNext headset has a viewing angle of about 105 degrees, giving it a significantly smaller field of view which makes for a less immersive experience. Unlike the Pansonite headset, the BNext VR Headset has a slot for you to slide your phone into the goggles (attached to a plate). The positioning of your phone in the phone casing requires some adjusting and seems a bit more complicated than the Pansonite headset. The front of the BNext headset can slide to the side exposing the front camera of your phone. So, you should be able to use AR apps. If you have a phone that is 6.1 or 6.2 inches, then the BNext headset may work better for you; however, if you want a more immersive experience and easier setup, you may want to go with the Pansonite. If you’d like to learn more about the BNext 3D VR headset or purchase one, you can find it on amazing by clicking this link. The Pansonite headset has a removable front place where you strap your phone into the phone casing. The BNext headset has a slot system for inserting your phone. 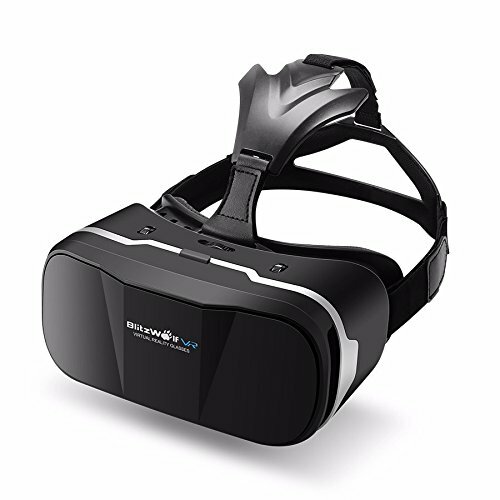 The Pansonite VR headset is an excellent mobile headset with quality lenses and several helpful features. If you want to get into VR, but don’t have a ton of cash to drop on a high-end headset, the Pansonic is a great entry point. While cheaper, it still gives an excellent VR experience and has some great features lower-cost headsets don’t have. 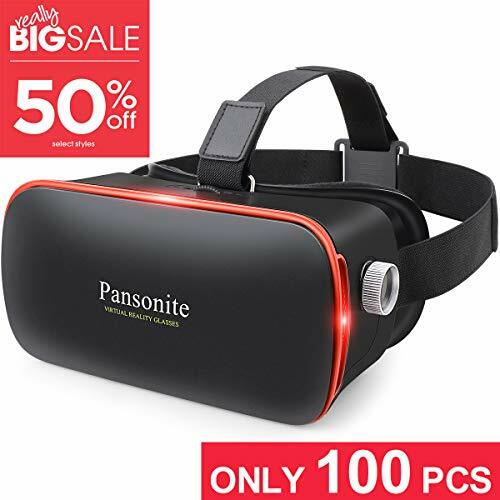 If the Pansonite VR headset sounds like something you’d be interested in getting, you can check out headset on Amazon by clicking this link.